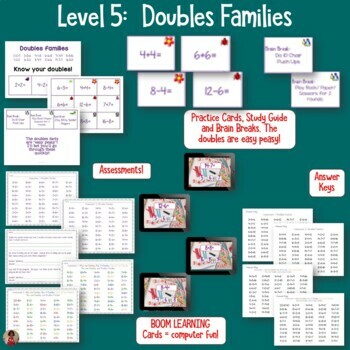 This system has everything you need for all your students to develop fact fluency in addition and subtraction! When learning basic math facts, it's not in the child's best interest to be given all 200 facts at once. 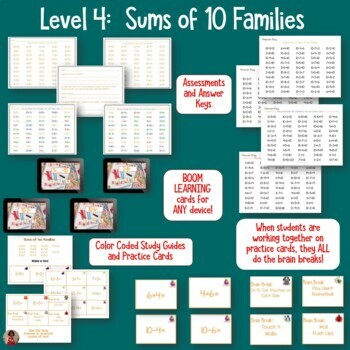 This system presents the facts by fact families, with 8 different patterns to study. Brain Research tells us that making connections to prior knowledge helps students remember information. It also teaches us that brains remember best using color, movement, and visuals. 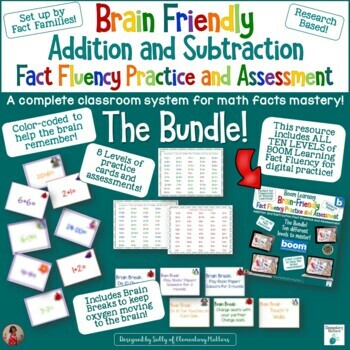 This resource has has everything you need to teach addition and subtraction facts through mastery in research based, brain friendly ways. Plus, there are color coded assessments for every step along the way. This system also includes a number of brain breaks, which have been proved to assist the learning process. 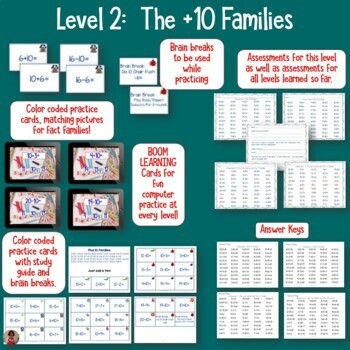 I've also included suggestions for which facts to introduce, in which order, color coded fact families, fact cards, a board game for practice, and assessments for each of the 8 sets suggested for addition and subtraction facts up through addends of ten. Plus, there are several ideas for developing an understanding of addition and subtraction facts, learning the facts, and assessing the facts. Addition and Subtraction Facts – Systematic Practice and Assessment Freebie. I often send information about freebies and sales to my followers. To become a follower, look for the green star near my picture and click the words "follow me". If you like what you see here, see my social media HERE.